Greek Alphabet letters are 24. Listen to the sound of the letters of the Greek Alphabet from alpha (A) to omega (Ω). The Greek alphabet is a set of twenty four letters used to write and speak the Greek Language. The Greek alphabet is in use since the late 9th or early 8th century BC with some small differences. Greek alphabet (elliniko alphavito - ελληνικό αλφάβητο) is considered the oldest alphabet in the world because it was the first to combine vowels and consonants with separate symbols. After all, the word alphabet itself derives from alpha and beta, the first two letters of the Greek alphabet. The 24 letters in the Greek alphabet are quite different from the letters of the Latin alphabet, despite the fact that the Latin alphabet is based on the Greek Alphabet. 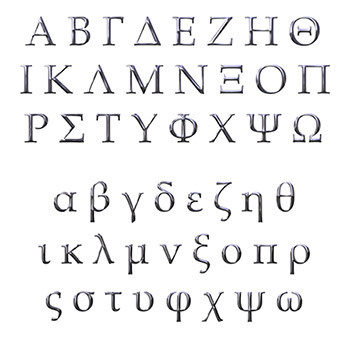 The Greek alphabet letters do not directly correspond to a Latin equivalent; some of them are very unique in their sound and do not sound in the same way, as those letters that may commonly be regarded as the corresponding Latin letter. Diacritics to represent stress and breathings were added to the alphabet in around 200 BC. These diacritics representing breathings were officially abolished by presidential decree in 1982, in order to make Greek language easier to write. The lower case Greek letters resemble the upper case Greek letters, but some of them are notably different. Letter gamma for instance is Γ,γ, while lambda is Λ,λ, mi is Μ,μ, ni is Ν,ν and omega is Ω,ω. In Greek we use accent mark (tonos - τόνος), which is placed only in lowercase writing and only over the vowel of the stressed syllable. In words with one syllable only, no accent mark is used. For example: ένα - ena (one), δύο - dio (two), Κρήτη - kriti (crete), που - pou (where). The Greek alphabet has many different types of letters with the same sound. If you hear a word that has some sound like –ee you should check its spelling. It could include –η, -ι, -υ, -ει, -οι. The same applies to "o", which can be ο - omicron or ω - omega. Examples of Greek letters with no Latin equivalent include Θ (Theta) and Ψ (Psi) as well as letters with less obvious differences such as Gamma, in speech, which is more akin to a y sound. Greek alphabet has the letter Δ(Delta) which sounds almost like a th (as in the word "this"), B (beta) which sounds like v and so on. The Latin alphabet has some script letters that do not exist in the Greek alphabet, such as B, C, D, G, W, Q and J.
W is a consonant in the Latin alphabet, but resembles to the Greek letter ω (omega) which is a vowel. In general, in Greek you pronounce whatever you read, the way you read it. Classical Greek pronunciation follows spelling, so A is - ah, Φ is – f , ι is – ee and so on. The only difference you will find is the pronunciation of diphthongs (see above). The equivalent of hard G, D and B sounds are written instead as ΓΚ (γκ) , ΝΤ (ντ) and ΜΠ (μπ) because there are no Greek letters for these sounds. During the byzantine times, the letter names were feminine nouns, preceded by the feminine article «η». Today, the letter names are neutral nouns preceded by the neutral article «τo». When you are referring to a letter you use neutral gender and nouns. Ancient Greeks used to write from left to right or right to left. This phenomenon was known as the voustrophedon system, in which the text could run from left to right (or vice versa), reach the end of the line and then start a new line from right to left. Voustrophedon or Boustrophedon is the Greek name for "ox-plough turn". This system was abandoned in ancient Greece once the alphabet was formed and established in the entire Greek region, but you can see it in the Inscription of the Law of Gotys. Today Greek is written from left to right.